(Curnow Play-Along Book). Before the current "praise and worship" music burst onto the scene, there were many time-tested hymns of praise. 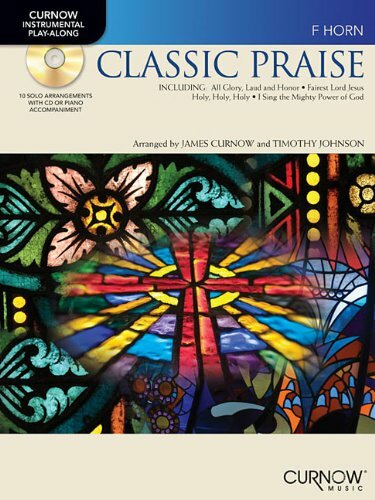 This collection of ten of those hymns, arranged in contemporary settings for the grade 2 to 3 soloist, is designed to be a valuable addition to any worship setting. Whether playing with the piano accompaniment or the CD (which is included), there will be an unmistakable attitude of praise in the air! Contents: Jesus Shall Reign * Fairest Lord Jesus * Holy, Holy, Holy * All Glory, Laud and Honor * To God Be the Glory * Praise, My Soul, the King of Heaven * All Hail the Power of Jesus' Name * I Sing the Mighty Power of God * Praise Him! Praise Him! * When Morning Guilds the Skies.